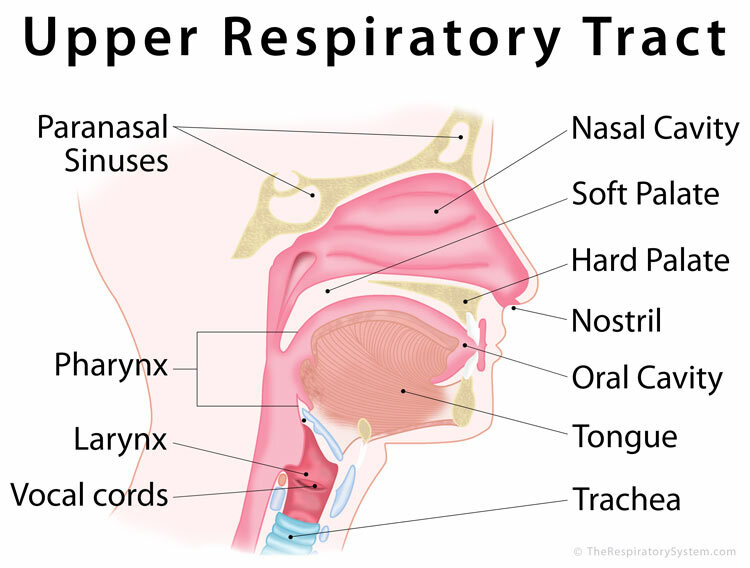 The first half of the airways in human respiratory system, the upper respiratory tract consists of the nose, pharynx, and larynx [1, 2]. The oral cavity, the secondary entrance of the respiratory tract, may also be included in the upper respiratory system [3, 4]. 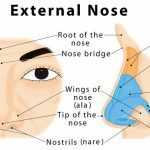 The nostrils, the two round or oval holes below the external nose, are the primary entrance into the human respiratory system . Lying just after the nostrils are the two nasal cavities, lined with mucous membrane, and tiny hair-like projections called cilia . During inhalation, the air passes into the nasal cavities through the nostrils, where it is cleaned (of any harmful dust particles or bacteria) and humidified by the cilia and sticky mucus . The purified air then makes its way into the next parts of the respiratory tract. 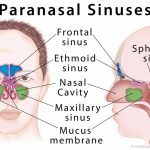 Paranasal Sinuses : There are four paired hollow spaces within the bones surrounding the nasal cavities that make the air remain within the cavities longer for humidifying it better, in addition to making the skull lighter and protecting the face from trauma [9, 10]. They are also instrumental in getting rid of the impurities trapped by the mucous membrane during purification of air . Despite not being one of the primary organs making up the upper respiratory system, the mouth is quite important in breathing, serving as an alternate pathway for air in case of a nasal blockage . 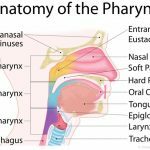 Beginning from right after the nasal cavity, the pharynx or voice box connects with the larynx below. The 4-5 inches long, funnel-shaped muscular tube  is responsible for carrying both food and air from the oral cavity down the digestive and respiratory tracts respectively . It also plays a vital role in speech production , and fighting infections (since it contains adenoids, or a collection of lymphatic tissues) . The larynx extends from the inferior end of the pharynx, continuing to the trachea, and connecting the upper and lower respiratory tracts . 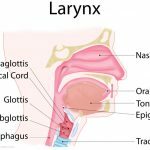 Apart from acting as the passage for air to flow into the trachea to reach the lungs , the larynx also houses the vocal cords that produce sounds to let us speak and sing . 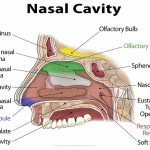 Like the nasal cavity, the rest of the parts of the upper respiratory tract also have a mucous lining to trap any remaining impurities or pathogens from the inhaled air. The hair-like cilia are also present to carry the debris back into the nasal cavity or pharynx, to be excreted through the nostrils or channeled into the digestive system [4, 16].